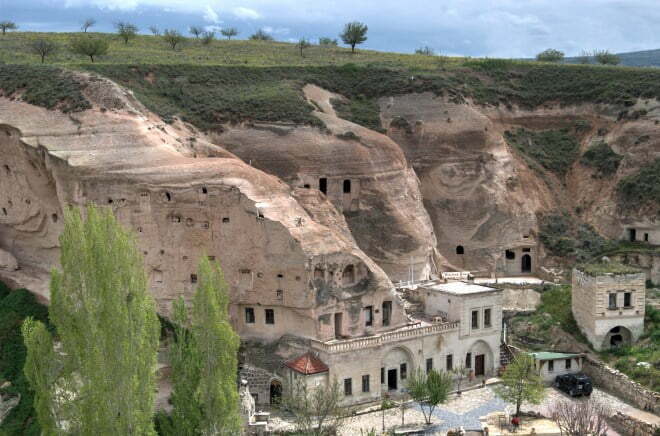 Cavusin old Greek village in the Cappadocia region of Turkey is rarely featured in travel articles. If it does appear, it garners a couple of sentences before the author talks about other more well-known places such as Goreme, the transport and accommodation hub. 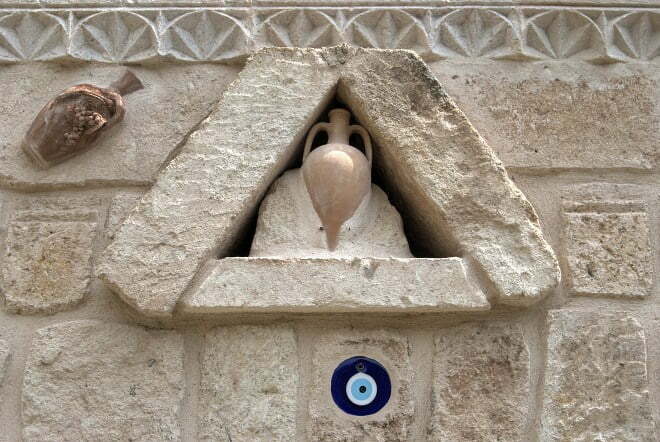 For this reason, even though, I had been to Cappadocia twice before, I had never bothered to go there. 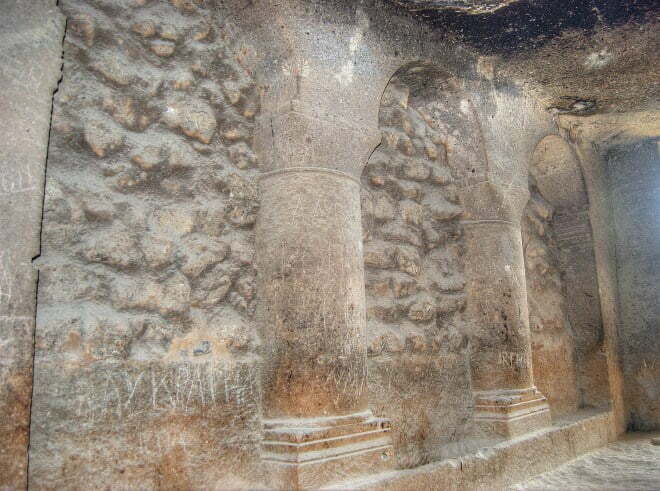 It is separated into 2 parts; the new town and the old greek village and on my third visit to Cappadocia, my tour guide recommended we change the itinerary for an hour to visit the 5th century church of Saint John the Baptist, situated in the old village part. Since the guide lived in Cappadocia, I followed his expert advice and we pulled up in front of the large rock face that forced Muslim locals to be evicted from their homes in the 1960s, after falling boulders became a safety hazard. The Christians had already left in the 1920s after the Treaty of Lausanne was signed. A small winding path led its way to the top of the hill, where the church was. As we started to walk, we passed a small and rather quirky mosque built into the hillside so it is possible to stand on the roof. With interest, I watched a young girl do this, posing next to the minaret, possibly for an Instagram photo. Somehow this seemed kind of disrespectful to me but no-one else was bothered. Following the winding and steep path, we passed many houses that were being renovated with a hint of Greek architecture. Others cave houses displayed a “For Sale” sign. Apparently, the government has done work to stop the hazards of falling boulders, and a lot of the old deserted houses are now up for sale. This isn’t a surprise because the Turkish property market has boomed since the turn of the century. 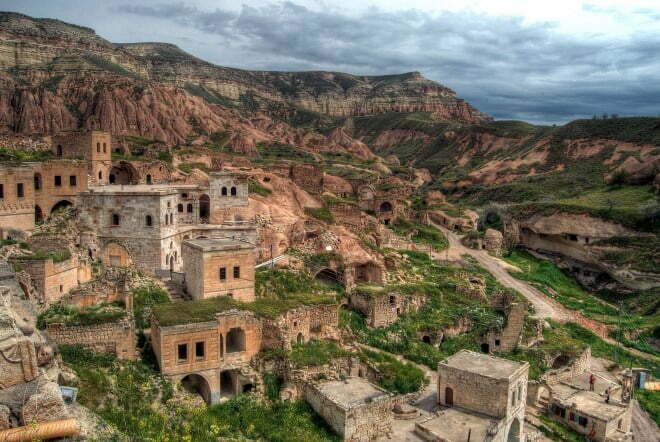 Strangely enough though, I never see Cappadocia property advertised for sale on the Internet. 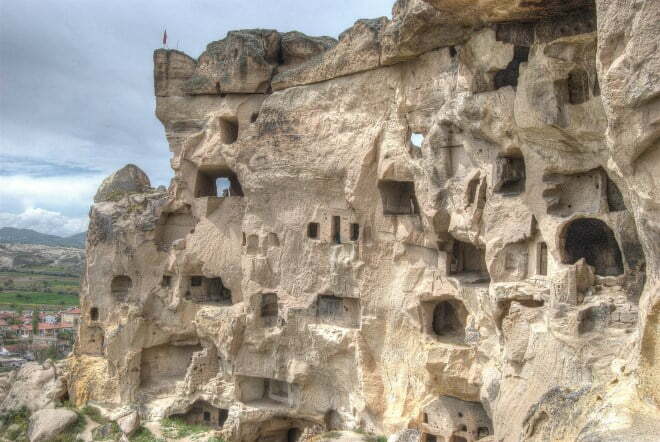 It seems to be restricted to an elite circle because renovated cave houses are a quirky trend and some of them fetch a high price, despite the fact that our earliest ancestors used to live in them. Go figure! When we eventually reached the top, the path became narrower but I stopped walking because the all-encompassing view caught my eye. It looked over the old town and further in the distance was Rose and Red valleys, that are both popular with hikers. The houses seemed miniature and the people like little dolls. Maybe I was just in a good mood that day, but I still remember it as one of the best views in the Cappadocia region. Following the path, it became narrower and crossing an extremely unstable and shaky wooden bridge, we arrived at the interior of the 5th Century church. The frescoes depicting scenes from the Bible were hardly noticeable and in some areas, the ceiling was pure black. After the Christians left, it was used as a pigeon shed but despite this, I definitely felt a holy atmosphere and I am not a religious person. 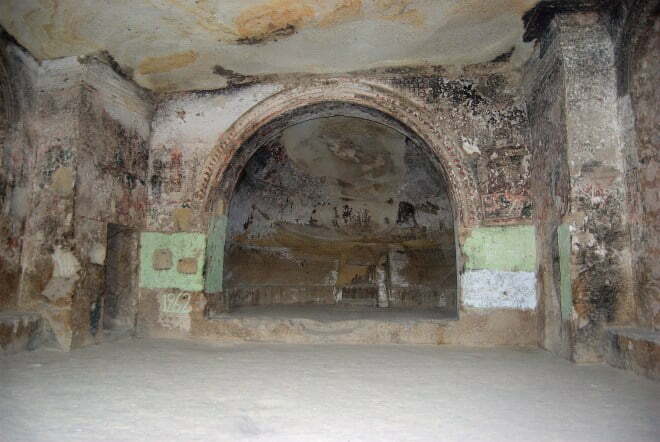 Maybe it was because of its large size compared to other cave churches of Cappadocia. It used to be one room, but in the 10th century, the supporting columns were strengthened by building them into walls, therefore now making three sections. Possibly, the holy presence was because of its precarious place at the top of a hill, reached only by a shaky footbridge. It makes the church, the perfect setting for an apocalyptic film but at least, this is not the end of the life-story of Cavusin. Will it revive itself to become a tourism hub? Will the renovated cave houses sell for a lot of money, therefore re-populating the area with posh snobs? Will someone eventually fix that stupid footbridge leading into the old church, before somebody breaks their neck? I hope so. The Cavusin old Greek village is charming and I now have a particular fondness for it. It will be interesting to see if it can live up to its potential. This was an amazing place. I loved it. Your right, it had a surreal ambience and a zen vibe about it. I was lucky enough to not have any other tourists except me on a lonely mid afternoon in late late december. I certainly missed this out when visiting. I really want to go again now.